The spa town of Bad Reichenhall can be found just over the border to Germany and therefore, makes a great day-trip destination from Salzburg. Bad Reichenhall is known for the scenic, alpine landscape that surrounds the town as well as for the brine springs that gave rise to spa tourism in the late 19th century. Many international visitors of Salzburg combine a trip to Bad Reichenhall with an excursion to Berchtesgaden and the Eagle′s Nest (Kehlsteinhaus). However, Bad Reichenhall alone is well worth a visit, and be it for the sake of "taking the cure": Enjoy a day in the thermal spa of Bad Reichenhall. In terms of sightseeing and attractions, there are a few things worth mentioning. Note for example the Bad Reichenhaller Philharmonie, founded in 1858. This philharmonic orchestra maintains its own concert hall in the city centre. There is a town museum, housed in a building that dates back to the early 16th century. Note also the salt museum (Salzmuseum) with a pump house at the Alte Saline. This building was erected between 1840 and 1851 upon order by the King of Bavaria, Ludwig I. The architect in charge was Joseph Daniel Ohlmüller and the Alte Saline is considered a very significant building of the age of German industrialisation. The old city hall of Bad Reichenhall was built in 1849. Frescoes were added in 1924. Note the Romanesque Basilica St. Nikolaus, a building with three naves from the 12th century. Today, it serves as the main parish church of Bad Reichenhall. Parts of the Medieval old town of Bad Reichenhall are preserved alongside with the castle Burg Gruttenstein (12th century), several towers and parts of the city walls. The former Augustinian Chorister monastery of St. Zeno also dates back to the 12th century and comes with the biggest Romanesque basilica of ancient Bavaria. Other churches of significance include the St. Johannes Spitalkirche, the oldest sacral building of Bad Reichenhall (first mentioned in the 8th century). The Kirche St. Ägid was built in 1159; the church St. Valentin in Marzoll dates back to the 8th century, even though it was altered in the Gothic and Baroque period. Walking through Bad Reichenhall, you will quickly notice the old age of the average person on the street. This is due to the town′s reputation as a good spot to retire and - more importantly - due to the large number of people who are there on spa holidays or a therapy. For some nature experience in Bad Reichenhall, think about taking the Predigtstuhlbahn, a cable car from 1928. You can also follow the course of the river Saalach and visit three significant buildings of Bad Reichenhall: A historic one from 1914 in Art Nouveau, the Royal Spa Hall (Königliches Kurhaus) from 1900; and the Public Spa Hall from 1928 in late Art Nouveau. Another brine attraction is the Gradierwerk, which is used to dispense the brine into the air. Within the town, there is the 4 hectare large Royal Spa Park (Königlicher Kurpark). 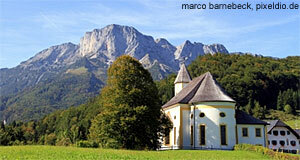 You can also hike along the Soleleitung, a brine pipeline between Bad Reichenhall and Traunstein. It was built between 1617 and 1619 and is considered to be the oldest pipeline in the World.